Wales & Borders Rail Services has awarded Stadler a contract for 71 CITYLINK tram-trains and FLIRT multiple units. This is Stadler’s second major contract for FLIRT multiple units in Great Britain. The bi-mode and tri-mode fleet for the Wales & Borders franchise fits seamlessly into the series of green developments by Stadler. In June 2017 Stadler’s first bimodal Stadler FLIRT went into service in the Aosta Valley (Italy). Newly developed dry-type transformers create savings of up to 7.5 percent of the net energy expenditure. In September 2018 the FLIRT Akku had its first successful test drive during the InnoTrans show. With these innovations in the area of alternative propulsion Stadler is heeding the call for the increased use of green technologies. Stadler’s major contract with Wales & Borders is for 36 three-car tram-trains, type CITYLINK and 35 FLIRT multiple units. The CITYLINK tram-trains use 25kV AC as well as battery power. 11 of the 35 FLIRT trains are diesel-electric, while 24 will be tri-modal. Depending on need and the conditions of the track the fleet will run electrically, diesel-electrically or using battery power. The tri-mode FLIRT fleet will consist of 7 three-car units and 17 four-car units. Once these trains become operational in 2023 they will run electrically north of Cardiff. The route to the south of Cardiff is not electrified. As a result, the rolling stock there will use a mix of diesel and electric traction. The use of batteries on the tram-trains and the multiple units is an innovative approach. It means the franchise operator can offer a contemporary and environmentally friendly service on the non-electrified lines and on the Valley Lines around Cardiff. The name Stadler is rapidly growing in recognition in the United Kingdom. Stadler has already been able to sign seven contracts for rolling stock. This year 58 FLIRT multiple units will enter service on the Greater Anglia network. Furthermore, 17 Stadler subway trains will enter service for SPT in Glasgow. In 2020 then 52 METRO trains will start serving the Liverpool area. 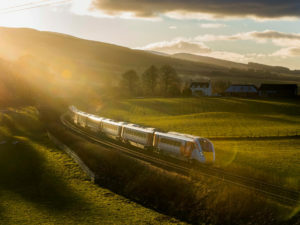 The first Stadler vehicles entered commercial service in the United Kingdom in 2013. They were 12 VARIOBAHN trams that now run on the Croydon-Tramlink network. In 2017 Stadler delivered seven CITYLINK tram-trains (Class 399) to Sheffield. The Stadler Class 68 and 88 locomotives, meanwhile, have become indispensable work horses on the British rail network.